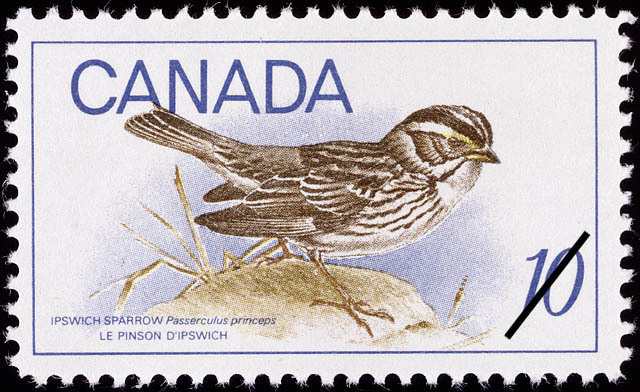 The value of a Ipswich Sparrow, Passerculus princeps - 10 cents 1969 stamp depends on several factors such as quality and wear, supply and demand, rarity, finish and more. Values in the section are based on the market, trends, auctions and recognized books, publications and catalogs. This section also includes information on errors and varieties and characteristics. The Ipswich Sparrow, a species first known to science through its discovery at Ipswich, Massachusetts, in 1868, has the smallest breeding range of all Canadian birds; its nesting grounds are confined to Sable Island, a small desolate island about one hundred miles off the coast of Nova Scotia where this bird has had to face many hazards. Annually it must fly from its mainland wintering grounds to its summer home on Sable Island; to reach that fog-hidden dot in the stormy Atlantic requires not only strong flying ability but accurate navigation. Its existence on the small insular breeding grounds was imperiled by the introduction of rabbits which depleted the vegetation. Next, cats were introduced, they reduced the rabbit menace but provided a new one. Foxes were put on the island; they eliminated both the rabbits and the cats in one season. Perhaps the greatest hazard to the Ipswich Sparrow is a possible loss of its nesting grounds; sandy Sable Island has been slowly but surely washing away and experts predict that it may eventually disappear.